This column was written by Daniel Freedman. Forget condemnations and Security Council talks. It's "Richard Armitage time" for North Korea and Iran. Kim Jong II and Mahmoud Ahmadinejad need a phone call from the White House warning them that unless they surrender their nuclear program and fully cooperate they'll be "bombed back to the Stone Age." This type of tough talk quickly brought Pakistan onside in the war on terror. The Neville Chamberlain-like behavior known as diplomacy, meantime, has only brought us broken deadlines and a greater threat from Iran and North Korea. The most recent consequence of which was when North Korea claimed to have conducted a nuclear test on Sunday night. Armitage's now-famous phone call to Pakistan after the September 11, 2001, attacks, where, according to President Musharraf, Armitage warned that unless Pakistan cooperates with America it will be "bombed back to the Stone Age," is how negotiations with rogue regimes should be handled. As Musharraf tells it his memoirs, he did a quick calculation, realized that he had no chance against America's military, and quickly ditched his support of the Taliban and offered America his full cooperation. Armitage denies making that threat and the Bush administration denies any knowledge of it. What a shame. It was one of the finest hours of American diplomacy. Whatever Armitage actually said, Musharraf thought he was being militarily threatened and he quickly surrendered. Appeasement, meantime, has been tried and failed with North Korea and Iran — repeatedly. The current standoff with North Korea is a consequence of President Clinton's appeasement. Under his 1994 "Agreed Framework" — negotiated by President Carter (who else?) — North Korea was given light-water reactors and other sweeteners. Clinton said his deal would "end to the threat of nuclear proliferation on the Korean peninsula." In 2002 the world discovered that Kim Jong Il had lied to Mr. Clinton and was secretly continuing his program. And then nothing happened — except more expressions of concern from Security Council members. So too with Iran. A few years ago the mullahs were caught lying for almost two decades about their nuclear program and … nothing happened. Instead, they, too, have been offered sweeteners in exchange for giving up what they shouldn't have had in the first place. In the cycle of broken deadlines and concessions that have followed, we're now still waiting a response to the August 31 deadline that the Security Council gave Iran to suspend enrichment. Pakistan isn't the only example of where the threat of force works. Colonel Qadhafi quickly surrendered his nuclear program when he thought he would be America's next target after Saddam. Pakistan, however, is the perfect example because of how well it rebuts the prime argument heard in favor of appeasement: Appeasers warn of the damage the rogue regimes can do to us if we threaten them. North Korea can fire missiles into South Korea. Iran can launch Hezbollah to strike harder at Israel and other American allies. But whatever weapons Iran and North Korea currently can retaliate with, they pale in comparison to what Pakistan could have done. Pakistan already had nuclear weapons. It could have fired a nuke into India or another American ally. And yet it didn't. Instead Musharraf made a quick calculation and surrendered. He realized that whatever damage he can do, America can still pummel his country back to the Stone Age. At which point he's out of power, and, in all likelihood, dead. The movie fanatic in Pyongyang and the theocrats in Tehran are no less concerned about their survival than Musharraf. The problem with our current policy toward Iran and North Korea is that we're acting as if we've forgotten that we're the superpower with the nukes and other weaponry that can flatten these rogue regimes. If the rogue states think we're bluffing — as they might after years of appeasement and broken threats — a quick flyover Tehran or Pyongyang with a few choice targets will shatter that illusion. Even if North Korea or Iran does strike back, it's still better than the alternative. The alternative is allowing them to develop their weaponry more and endanger more people. How much damage could they do when they're able to fire nukes? The alternative also means that terrorists may end up with nukes, too. As Secretary Rumsfeld said in August of North Korea: "They sell anything to anyone. They sell our currency that they counterfeit. They're selling illegal drugs. They're selling basic missile technologies. There's not much they have that they wouldn't sell either to another country or possibly to a terrorist network." Iran already gives whatever weapons it has to its proxy terrorist groups. This is why it's urgent that America, and not just Iran and North Korea's immediate neighbors, act to stop these rogue regimes acquiring nukes. It wasn't only bomb material that exploded Sunday night in North Korea. With it went any remnants of credibility of the arguments of those who have been advocating appeasement toward North Korea and Iran. 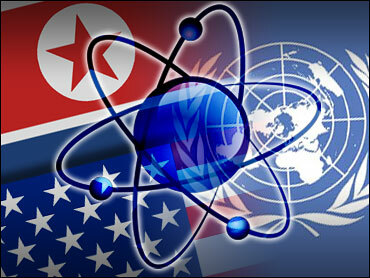 The only good news is that North Korea and Iran don't yet have the means of firing a nuclear weapon. The bad news is that with every moment of inaction that threat becomes more likely. Daniel Freedman is editor of the online edition of the New York Sun.